Amidst reports of IRCTC barring certain banks from using its payment gateway for debit card transactions, the railways’ tourism and catering arm issued a statement denying the reports. The IRCTC has said options to pay through payment gateway using debit/credit card and internet banking are open for all banks. “No debit or credit card of any bank has been restricted by the IRCTC for acceptance on any of the gateway,” it said. Debit and credit cards of any Indian bank powered by Master or Visa, can be accepted in any of the seven gateways on the site, the statement clarified. However, it said the IRCTC has provides a value-added service of direct integration to some banks which would allow speedy transactions and reconciliations. “Since direct integration comes at an added cost to the IRCTC, these banks were asked to share a part of their transaction charges with IRCTC,” it said. A senior official of the IRCTC said that it was not possible for it to bear cost of individual linkage to bank websites. “IRCTC had asked banks to share the revenue earned from online tickets because of these value-added services but some banks refused,” he said. The IRCTC has said that if banks are willing to give the facility of zero transaction charges on their debit cards to rail ticket customers then it will give them the facility of direct debit card integration also. The statement has further said that banks should abide by the RBI guidelines regarding transaction charges on debit cards by charging only 0.25 per cent on transactions of up to Rs 1,000 and a maximum of 0.5 per cent on transactions of values between Rs 1,000 and Rs 2,000. Anywhere, anytime bill payment will soon be available for all citizens for all utilities under the Bharat Bill Payment System (BBPS). MUMBAI: Anywhere, anytime bill payment — currently available to only a section of Indians with access to netbanking and that, too, restricted to a handful of utilities — will soon be available for all citizens for all utilities under the Bharat Bill Payment System (BBPS). The Reserve Bank of India (RBI) on Friday outlined the final guidelines for the system, which envisages a central entity setting standards and rules, and a host of registered service providers who will aggregate biller information to facilitate anytime and anywhere bill payment. In other words, an individual can collect all his bills — telephone, electricity, water supply, insurance, etc — and pay them through one window. This will be made possible by creating a network of agents, enabling multiple payment modes and providing instant confirmation of payment. The BBPS will also include existing players in the online commerce segment catering to the requirements of bill payments as well as aggregation of payment services in relation to bill payments. To facilitate BBPS, the RBI will give recognition to a central entity Bharat Bill Payment Central Unit (BBPCU), which will set the necessary operational, technical and business standards for the entire system and its participants. It will undertake clearing and settlement activities. Banks will operate as Bharat Bill Payment Operating Units (BBPOUs), which will be the authorized operational units, working in adherence to the standards set by the BBPCU. Besides banks, firms that currently operate as bill payment aggregators can also be part of the system. “The tiered structure could be further strengthened through an effective agent network/s of the BBPOUs. While there will be a single BBPCU, there could be multiple BBPOUs operating under the BBPS,” RBI said. The big spenders are expectedly pampered, with credit card issuers and merchant outlets showering them with discounts and freebies. In recent months, however, two private-sector majors ICICI Bank and Axis Bank have expanded their scope of offerings to cover the savers as well. The banks are promising to reward customers having savings bank accounts with loyalty points for carrying out a variety of transactions. While a plethora of freebies is being offered on a platter, on the flip side, there is the tedium of keeping tabs on the reward points and redeeming them. If you want to make the most of the loyalty programmes, you need to understand how they work and avoid the peril of over-spending. The savings account holders in banks that offer reward point programmes do not have to make an effort to sign up for it since they are enrolled by default as soon as they open an account. “Our MySavings Rewards Program and credit card programmes are designed to reward and encourage customers to carry out more transactions with us. These help them accumulate points for almost every transaction,” says Rajiv Sabharwal, executive director, ICICI Bank. The transactions include simple ones like activating Internet or mobile banking, opening a recurring deposit account, updating your mobile number through an ATM, or registering for an e-statement. Then there are more complex activities like taking a loan or paying utility bills using the online payment platform, even making an EMI (equated monthly instalment) payment on time. To be eligible for the reward points, the retail customer needs to fulfil certain conditions. For instance, in the case of ICICI Bank, the account holders are required to maintain a minimum monthly average balance of Rs 15,000, while the NRI customers are not eligible at all. Similarly, you become eligible for the Axis Bank’s eDGE Loyalty Rewards Points programme when you open a savings account, use its debit or credit cards, and online channels of shopping. However, to qualify, you should have no outstanding dues and the eligibility criteria are open to review from time to time. The public-sector banks, however, are not rewarding their savings account holders and have largely limited themselves to card spends for now. “Banks are increasingly using loyalty programmes to induce consumers to use debit/credit cards, as well as Internet and mobile banking. The objective is to incentivise them to use their cards instead of withdrawing cash from the branch or ATM. Once consumers have accumulated points, they can redeem these in return for free goods or services,” says Bijaei Jayaraj, CEO, Loylty Rewardz, which manages loyalty programmes for several PSU banks, including the State Bank of India. You earn different reward points depending on the kind of transaction and card type. So while you earn 1 point for every Rs 100 you spend online through Net or mobile banking with the ICICI Bank, you can get 100 points for just activating the Net or mobile banking. In the case of Axis Bank, you can earn 25 points for ordering a new chequebook online or via an ATM, but get 500 points one time when you open a Wealth or Privee account. How do you keep track of your reward points? Since the ICICI Bank’s points are managed by PAYBACK, the multi-brand loyalty programme, you can either get in touch with its contact centre/website, through the bank’s website, or even via your account statement. To redeem points, you have to choose from the list of products or services up on the bank’s website and call up the bank to communicate your decision. You can also redeem the points directly through the Internet channel by clicking on ‘redeem’ at the bank site. You’ll be taken to the PAYBACK website, where you can pick your product/service. You can also shop at PAYBACK’s online partner sites, or directly at specified merchant outlets by swiping your card. As for the Axis Bank, you can pick from 500 rewards from a range of lifestyle and entertainment products and services, provided that you have accumulated a minimum of 300 points. A high-end credit card is bound to offer a better spend-to-reward point conversion ratio compared with a no-frills card. However, such cards typically entail a huge membership fee. Plain-vanilla cards may not levy a big fee, but could require you to make substantial purchases to be eligible for worthwhile rewards. Availing of cash-back offers is relatively easy as you have to simply swipe your card at the merchant outlets or make an online purchase and the applicable amount will either be credited to your account or the discount factored into the bill. While both cash-back and reward point programmes seem attractive, it requires you to choose your bank or card, as well as rewards, carefully. “So, if you watch movies or dine out often, pick a lifestyle card that offers additional points on such spending. If you are a frequent flier, look for a card that converts points into miles and entitles you to concessional fares,” says Harsh Roongta, CEO of Roongta Securities. Another popular category is the one that offers points on refuelling. On the other hand, cards or savings accounts that entitle you to, say, 5% cash-back on payment of utility bills will be useful for all segments as it is an unavoidable expense. Ensure that you exercise caution while choosing cards for the cash-back benefits as banks and card issuers routinely revise their offerings. Besides, your spending pattern should justify the membership fee. The last thing you should do is to sign up for a card only to avail of the reward points or cashback offers. Moreover, your bank or card issuer could levy an ad-hoc handling fee for delivering your product at your doorstep, reducing the actual value of the benefit. 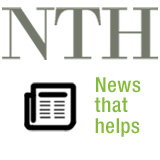 Many credit card users believe that hoarding a large number of points for months or years will help them buy an expensive TV or a high-end refrigerator. However, you need to ascertain whether the bank or card issuer has specified a validity period for redeeming the points. Otherwise, you may end up waiting for months only to find out that the offer period has expired. Just days after banks withdrew EMI (equated monthly instalment) schemes on credit card purchases for gold, online sales of the yellow metal fell 20 per cent, the first time since e-tailers started operations. “In just four days, our sales have dropped 20 per cent. It was first HDFC, now ICICI, HSBC and Standard Chartered Bank have all stopped their EMI option. We have been getting calls from customers about failures in payment processing,” said Gaurav Khuswaha, founder of Bangalore-based Bluestone.com. He said the RBI guidelines were for the purchase of gold coins and bars and not for jewellery. “The move will impact our jewellery sales, though we don’t sell gold coins. We are planning to take up this matter with the banks directly and also with the Gems and Jewellery Federation of India,” he added. A gold rush of sorts is being witnessed not just in the brick-n-mortar jewellery stores, but also with online players, including Snapdeal, eBay and Indiatimes, ever since gold prices plummeted in the last two months. Customers who buy gold jewellery online have not been able to click on the credit card option to convert their jewellery-buy into an easy EMI. Acting on a recent RBI guideline, most banks have stopped the EMI options in a bid to discourage consumers from buying gold in any form. The regulator’s move was to curb demand for gold and its import, in an attempt to reduce the current account deficit (CAD). While the move has impacted brick-n-mortar retailers, it is likely to pinch virtual jewellers more, as about 20-25 per cent of their sales are through the online route. Easy access to the Internet, high disposable income, easy payment options, range of designs and convenience of home delivery offered by e-stores had encouraged many consumers to buy online. Kama Jewellery, a gold retailer, that runs an online portal Kama Schachter, said with one piece of jewellery being sold every four minutes in India, online purchase of jewellery was a trend that had caught the fancy of the younger crowd. Most of these consumers look for easy EMI options that come with zero per cent interest. “Recent announcement by financial institutions prohibiting the use of credit cards for easy EMI on jewellery purchases has hit online jewellery sales in big way. EMI accounts for about 40 per cent of our sales,” said Sandeep Jain, V-P (Sales), Kama Jewellery. The e-tailer, as an immediate measure, is pumping up the entry point stocks to make sure that there is something for everyone, said Jain. Several banks, when contacted, declined to comment. Did you know that approaching a bank branch to get a duplicate account statement can cost you around Rs 100, while the same could be had at half the price through online banking? Similarly, a stop payment request that costs upwards of Rs 50 through traditional banking channels is a free service for those who opt for Net banking. 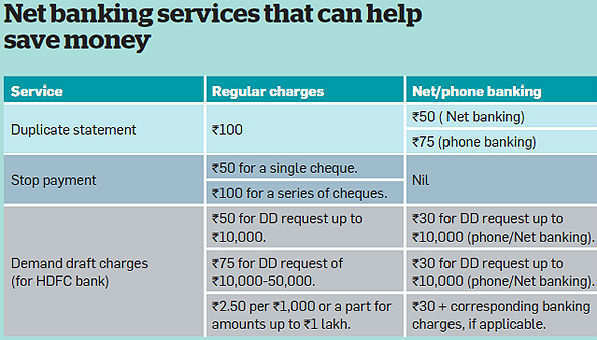 There are many other banking services where you can save money by opting for Net banking (see table). However, most people, especially those who prefer branch banking, don’t even realise they are paying for these services or that their costs are adding up unless they peruse their quarterly bank statements carefully. Why is Net banking cheaper? According to Ram Sangapure, general manager, Central Bank of India, facilities like online and mobile banking drastically cut down the cost of providing a service. This saving is passed on to customers who are willing to go beyond the traditional banking channels. “A bank branch has to employ people, incur cost for stationery and in setting up the office. Moreover, paperwork eats up valuable man hours. If the customer uses the online option, a bank hardly incurs any cost, which benefits the former,” he adds. According to industry experts, a bank spends an average of Rs 40 for each transaction conducted at a branch. If a customer uses the ATM facility, the cost drops to Rs 18-20 per transaction, but it is still much higher than the cost involved in online banking. “In order to promote Net banking, the financial institutions offer certain services for free or charge a nominal amount,” says Sangapure. According to Harsh Roongta, chief executive officer of Apnapaisa.com, banks across the world are within their rights to charge for any service for which they incur a cost. Now, this is being practised by Indian banks as well. Says Rajiv Raj, co-founder and director at CreditVidya.com: “Only if a bank doesn’t incur any cost in completing a transaction will it refrain from charging the customer,” he adds. In fact, the RBI has not restricted any bank from charging a fee for such transactions. “If you deposit a physical cheque from another bank and it is credited to your account, both banks incur a cost, but you are not charged anything. In the long run, the banks need to recover this amount to sustain themselves,” explains Roongta. “The RBI restricts unreasonable charges. 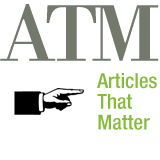 If the fee is within permissible limits and the bank can justify it, it can deduct this from their customers’ account,” adds Roongta. To keep abreast of the paid services and differential pricing, all you need to do is to visit your bank’s website. Moreover, the details of services and respective fees will be posted on the notice board in every bank branch. Net banking also helps save money in other ways. For instance, if you have opted for the facility to pay bills online, you can skip the late payment fee. In addition, there are service providers like credit card issuers, who charge a fee for branch payments. Some banks also offer bonus points for online services, which can then be redeemed for online shopping through the bank’s partner. Consider the ICICI Bank’s Payback facility and State Bank of India’s Loyalty Rewards programme. The benefits of Net banking notwithstanding, a lot of people balk at availing of this option because of the concerns about the security of online transactions, especially in an age where phishing and online fraud is on the rise. 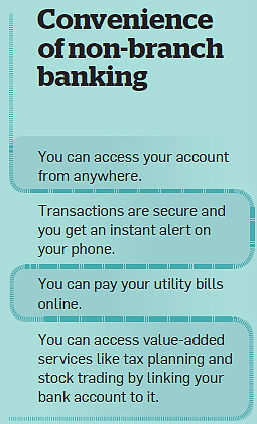 Raj, however, counters this, saying that Internet banking is probably safer than physical transactions. “Banks have introduced a double authentication system, which makes Net banking much safer,” he says. According to him, each customer is given a unique password to log into his account. To complete any transaction, he needs to key in an ID sent via SMS to his registered mobile number. “So it is not possible to go wrong. It’s highly unlikely that any other person, even a fraudster, could have both the unique log in/password and the registered mobile number,” he adds. Incidentally, you don’t get any security assurances while transacting physically at the bank. “One for everyone. Pick the card that suits you the best! It’s good to have a credit card that’s like you!” reads a promotional mailer from Standard Chartered Bank. It further reads, “5 per cent cashback on all fuel spends, all phone bills, all utility bills on Titanium Card.” Platinum card offers five times rewards on dining, hotels and fuel and so on. If you see such an offer, will you apply for the cards? Likely; who does not like discounts and freebies? This is why many own multiple credit cards, with multiple benefits. Some go to the extent of saying these benefits help counter the high prices to some extent. If you pay, for instance, an electricity bill of Rs 1,000 using a cash-back card, the card will offer you five per cent of your bill amount, that is Rs 50. You pay only Rs 950 on your card. Reward offers on credit cards work differently. You get cash benefits in the form of coupons or vouchers for a certain number of points collected on purchase through the credit card. For instance, for every purchase through Standard Chartered’s Platinum Rewards Card, you collect 3,000 points, which earn you Big Bazaar coupons worth Rs 1,000. Which of these works better for a cardholder? “Collecting and redeeming reward points for lifestyle or other expenses works out better for card holders. Once a customer has collected enough points, s/he can use those for specified expenses at their will.” says a senior official of HDFC Bank. It might not always be different cards that offer cashback and rewards benefits. Sometimes, the same card offers both these. According to an SBI official, banks discourage customers from cashback cards, as banks have to pay in cash to the customer. With rewards points, banks have nothing to lose. Also, those who really take advantage of such offers are high spenders, making it an expensive proposition for banks. Let’s see which option works out better for cardholders. We take the example of Standard Chartered’s Super Value Titanium (cashback card) and Platinum Rewards card. You spend, say, Rs 60,000 a year on fuel for your car. With the cashback card, you will get a five per cent cashback, according to the Standard Chartered bank’s mailer. However, the actual cashback works out to be 2.5 per cent. Reason: The five per cent cashback offered by Standard Chartered’s Super Value Titanium is in fact 2.50 per cent cashback and 2.50 per cent fuel waiver surcharge. This means by spending Rs 60,000, you will get back Rs 1,500 in a year. The fuel surcharge is offered by the rewards card as well. In contrast, the rewards card will give you 3,000 points, which means Rs 1,000 worth of Big Bazaar coupons for spending. This means the cashback card offers a better deal. However, the reward card does not levy any joining or annual charges on the cardholder. However, the cashback card levies an annual fee of Rs 750, which brings down the saving on the card to Rs 750. This makes the total earning on reward cards higher by Rs 250. “For small spenders, both these cards offer almost the same deal. However, for big spenders, the cashback card is a better deal between the two,” says certified financial planner Malhar Majumder, executive director of Kolkata-based Fine Advice. If the annual fuel spend is doubled to Rs 1.20 lakh, then the cashback would be Rs 3,000 and rewards would be worth Rs 2,000. Even if you take into account the annual fee levied by the cashback card, you would get a total cashback of Rs 2,250, higher than the offer on rewards card. “Rewards tend to be more when you are opting for lifestyle and related expenses, less when you are looking at regular needs, like Big Bazaar coupons. Also, money is spent first and rewards come later. In the case of cashback cards, you get direct discounts on items you have to buy regularly like fuel or electricity. A 2.50 per cent discount saves on immediate cash outflow. Cash discount frees up cash. Reward points are connected to spending programmes, usually lifestyle-related, which you may not need immediately,” adds Majumder. A cashback card helps you in two ways. One, it brings home the direct benefit of discounts. Two, it saves you the pain of choosing an item to buy from the reward catalogues, which might not be really worth the price shown. Of course, the benefits of both cashback and rewards are available at select merchant outlets with which the card manufacturer has a tie-up. Hence, you might not have too many options to shop. Many times, discounts/rewards for fuel purchase are available only when you swipe your card on the card issuer’s machine. Finally, credit cards should be used judiciously. Keep a record of your estimated monthly expenses that may get cashback. Calculate how much you save if you go with the card. Remember to check on joining if there are any annual fees. Go for it only if you save a decent amount after paying for fees. Do not spend just because there is a cashback offer as you have to pay the outstanding amount lest you’ll land in a debt trap.